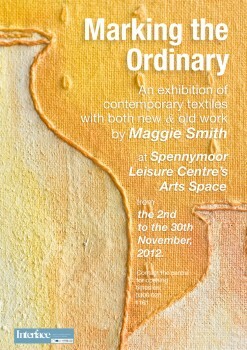 My latest exhibition of contemporary textiles, entitled “Marking the Ordinary”, launched on November the 2nd at Spennymoor Leisure Centre’s Art Space and will run until November the 30th 2012. On display will be a collection of my 2D art and mixed media work which I’ve created over the last 6 years, including some contemporary still life artwork that uses the plaster, paint and stitch techniques found in my Get Plastered book. For the first time both the original front cover pieces from my books Get Plastered and Get Stuffed will be on show, as well as several of the example pieces that were used to illustrate pages and ideas in Get Plastered. I find inspiration in ordinary objects and, through photography and drawing, these form a starting point for my work. Observation of the marks these objects acquire as they are handled and age lead to an exploratory process of wearing away, mark making and layering, through stamping, colour washes and stitching. For me, “Marking the Ordinary” connected the process to the result. The Art and Exhibition space is located inside Spennymoor Leisure Centre, and shares the same space as the lovely “Kilnrooms” on-site Cafe. This entry was posted in Announcements, Exhibitions by Maggie. Bookmark the permalink.